James McCallum is an artist based in North Norfolk. He is a graduate of The Royal College of Art and is best known for his watercolour paintings of the natural world, particularly birds, made outdoors from life. 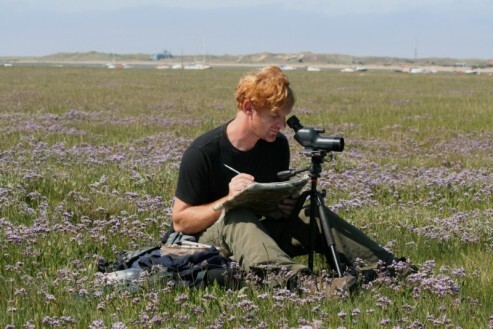 Working directly from nature has enabled him to develop a thorough knowledge of the behaviour and visual language of wildlife in its chosen surroundings. The behaviour of wild creatures is frequently complex and often surprising and he uses drawing and painting as a means of recording what he sees. Correctly interpreting and accurately representing fleeting moments of action has proved an exciting challenge and has increasingly become a focus for his work. The resulting pictures made rapidly whilst watching have an authenticity and energy difficult to reproduce in the studio. Although happily engrossed in studying the wildlife of his native Norfolk, his interests, particularly in migrant birds, have taken him to many parts of the world. These have included visits to Europe, The Middle East, Africa and Japan. The North and Arctic have a special appeal and have resulted in trips to exciting destinations such as Spitsbergen and Hokkaido. Most cherished are long periods spent in Finnish Lapland, Varanger and Alaska and joining Russian expeditions to remote regions of Chukotka and Kamchatka. The results of some of these trips to the North were published in his book Arctic Flight which was awarded ‘Best Bird Book of the Year’ in 2007 by British Birds and The British Trust for Ornithology. Eight books of his paintings and observations have been published.